Click here for Time Splits and Finish Times! After the Awards Banquet and a day or so of rest we’ll post our race report here. In the meantime, a brief summary is below. In the meantime, we hope you enjoyed following the race LIVE on Twitter and Facebook. Check out the wonderful video coverage of the race, courtesy of Ultra Race Report. Episode #1 Video here! Episode #2 here! Episode #3 here! Episode #4 is here! VOYAGER RACE: Outstanding and superbly impressive finishes by our top Voyager male and female winners! David Haase not only wins the Voyager Division with a course record breaking time of 33 hours 56 minutes, but has the overall best time of all solos in the 2014 race! A Voyager actually taking best time overall has never occurred in the history of the race; so our hats off – and we bow down to Champion David Haase! Janet Christiansen was the top female, and shattered her own course record by nearly FIVE HOURS with her spectacular time of 39 hours 55 minutes. SOLO RACE: Congratulations to Paul Spencer, who takes the solo division with a time of 36 hours 32 minutes; and Jim Ryan from Sammamish, WA, who won the Solo 50+ with his time of 37 hours 24 minutes. Solo 60+ Luis Bernhardt from Burnaby, Canada, was the first ever FIXED GEAR racer at the Hoodoo. We never thought it was possible to complete this incredibly challenging course on a fixie – but wow! Not only did he do it, but he was the oldest finisher, took 1st in the 60+ division and set a course record with his time of 42 hours 52 minutes. Impressive, indeed! Kudos to all our Solo and Voyager finishers who made 2014 the BEST year ever, especially regarding our solo finishing rate! TEAM RACE: Congratulations 2-Man Team Metal Spy Ultra Racing who annihilated the course record with their lightning fast time of 25 hours 7 minutes. They crushed the prior 2-man record by 3 hours 42 minutes!!! With the exception of the current record for the 4-man division, this amazing 2-man team has bested the finish time for every 4-man team that has ever raced the Hoodoo! Superb! Spectacular! BRAVO BRAVO BRAVO! Defending 4-Man Champions, Team Chubby, repeated their win and also set a personal best time of 29 hours 51 minutes. Always a crowd pleaser, the Chubbies also entertained us at the start line and drove the fans wild by tossing Twinkies into the crowd at both the pre-race meeting and post-race awards banquet. For the first time in the history of the Hoodoo, we were honored to host a 4-man 70+ team! Yes, you read that right: SEVENTY PLUS. 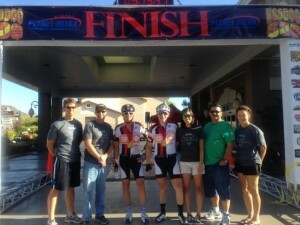 Team Griz set a course record of 31 hours 21 minutes; and was the 2nd fastest team overall! Wow! Several records were set in the team division this year, and we applaud each and every one of the racers who went out there and gave it their all! Awesome! STAGE RACE: With “Race On,” Mike Coughlin took the lead and didn’t look back, winning the inaugural Hoodoo 500 3-Day Stage Race in 26 hours 46 minutes. 300-MILE RACE AND STAGE RACE: Matt Tague took a commanding lead and never looked back, winning the Hoodoo 300 in 19 hours 26 minutes. The inaugural stage race champion is Robert Mutel with a time of 24 hours 19 minutes; and Team Shake and Bake raced to set a course record for the 2-Person stage race in 15 hours 30 minutes.